Having a bridge is like having three crowns. The teeth on either side of the missing tooth are prepared for crowns, an impression is made, and the case is sent to a dental laboratory. The laboratory then makes the crowns and fastens a false tooth between the two crowns—this is a bridge. The advantages of a bridge are that it is fixed, stable, and feels like your own teeth. In most cases it can be made to look just like you never had a tooth missing. The disadvantage is that you have to treat two teeth besides the one that was extracted—these teeth may otherwise be perfectly sound with nothing wrong. An Encore bridge is a special type of bridge that is exceptionally esthetic. A Maryland bridge is the least expensive type, but has some esthetic problems. Using the ovate pontic technique with a dental bridge can create the illusion that the false tooth is growing out of the gum. Something removable can be used to replace a missing tooth. This can be anything from a budget “dental flipper” (a piece of plastic with a false tooth attached) or a Nesbit (a single back tooth clipped to the adjacent teeth), to a more sturdy metal and acrylic removable partial denture. 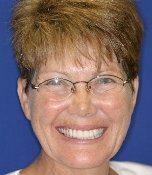 The advantages of the removable partial denture appliance are that it is a more economical way to replace missing teeth than a fixed bridge. Also, you can replace multiple teeth with one appliance. If the span of missing teeth is three or more, or if there are not solid teeth on both sides of the missing teeth, a fixed bridge may not work. The disadvantages are that it may not be as esthetic as a bridge. Clasps will be required to retain the removable partial, and it may not be possible or practical to entirely conceal those (though that problem can be avoided often with a “precision attachment” partial). Also, there may be some discomfort with wearing removable hardware in your mouth, and it is not as stable as a bridge. Here is a sample case from Dr. Blaine McLaughlin in Cedar Rapids, Iowa, showing how, in the hands of a competent cosmetic dentist, a removable appliance can be made quite esthetic. 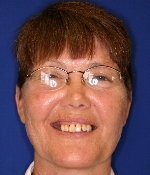 Terri had crowns in the front and a removable appliance to replace her back teeth. The advantages of an implant are: No teeth on either side have to be prepared for crowns, so there is no grinding on “good teeth”—you just fix the missing tooth. Implants can also span the space of multiple missing teeth. There is no limit to the span they can cover, as long as the patient’s health is good and there is healthy and adequate bone to support the implant. An implant also is fixed and feels just like your own teeth. Read our more thorough discussion of implants, plus see before-and-after photographs, on our cosmetic dental implant page. A diagram of an implant tooth between two natural teeth. The disadvantages of implants are that they can cost more and be more time-consuming, and the cost may not be covered by dental insurance. You will likely have to deal with two dentists—the dentist who does the surgery to place the implant, and the dentist who puts the false tooth on top of the implant. There is also a delay in getting the false tooth or teeth—a healing interval of several months may be required before the artificial root can have a tooth placed on it. There is also surgery involved with its attendant discomfort and healing period. However, if you are missing multiple teeth or all your teeth, there is a strong advantage to dental implants in that they will preserve the jawbone. Sometimes dentists don’t explain the negative long-term consequences of missing teeth, which are that your jaw gradually shrinks until you can’t wear any removable appliance. To read more about this, please see our page about facial collapse. So if you want to still be able to eat when you’re 80, you may want to consider investing in dental implants to replace those missing teeth.